My fifth and final scarf for donation to the Orphan Foundation of America is something I’d been wanting to do for awhile. I love texture and have been intrigued with the popcorn crochet stitch which creates a knobby little bump similar to a piece of popcorn (also my favorite snack!). I created this easy crochet scarf pattern with three rows of popcorn stitch running the length of the scarf. For added dimension, I staggered the rows to make it a more interesting design. 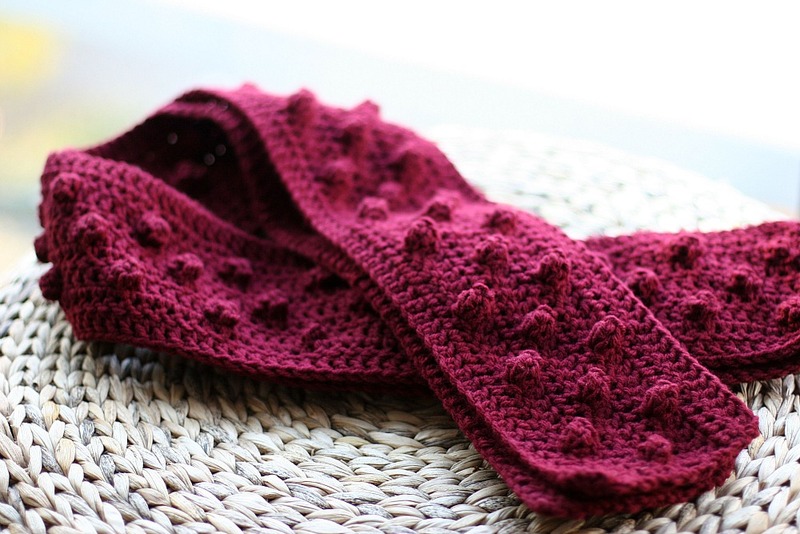 The finished scarf is just as I’d hoped it would be – bumpy! How to make a popcorn crochet stitch? Popcorn crochet gives such an amazing texture to a finished product and is so simple to do. It’s a little tricky to describe in words, so I’m including this helpful video showing several methods for making popcorn stitches. Row 2: chain 2 (counts as first dc), dc in next stitch and in each stitch across. Row 3: chain 2 (counts as first dc), dc in each of next 4 stitches, popcorn stitch (pc) in next stitch; *dc in next 5 stitches, pc in 6th stitch. Repeat from * to end. Weave in your ends and you’re all done! You could also add a fringe to the scarf but I decided to leave this one plain. With the dark burgundy color I used, it seemed more modern and classic to leave it without fringe, but that’s just my personal preference. I’d like to play with this pattern using multiple colors in the same scarf. I think the popcorn texture set off by contrasting colors could be fun. I haven’t crocheted in many many years so I wanted to test myself by committing to a crochet project. 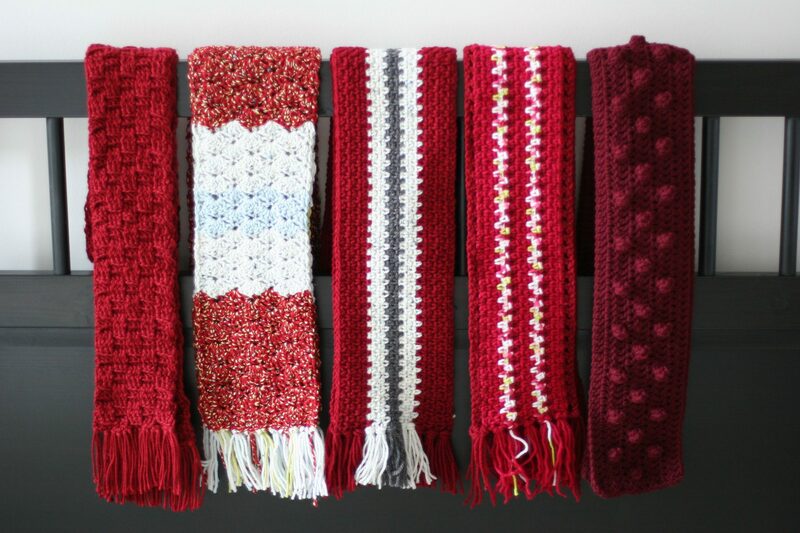 I selected the Orphan Foundation of America’s red scarf donation project and was determined to complete all five scarves … and fortunately, I did! I’ll send them off later this week and am heading off to the store later today to purchase knitting looms. More on the knitting looms coming soon! If you want to get started on making a red scarf, I’ve liked working with the Red Heart ‘Soft’ line of yarn. It’s more affordable than some other brands, and I like its feel. Okay, did you say that you just started crocheting again after many years? I am so jealous of the skill level that you are showing with your scarfs! They are all so beautiful. I just started knitting again, but am only on the simple garter stitch – not advanced enough to be able to join you in this project this year, but maybe next year. Thank you for sharing the bubble scarf pattern with us. Thank you, Elaine! Crocheting is like riding a bike, you never forget it once learned. Although I haven’t crocheted in a few years, I’ve been crocheting ever since I was a boy … so that’s like 30 years … yikes! I have a lot of respect for knitters and wish I could do it better. I think knitting is much more difficult than crocheting! Keep practicing and look forward to seeing your work in the future.